I don't know that you can really nail down on my style. I am a little bit of everything but I guess you can call me transitional? I love to mix modern and traditional together but I really try to keep at least one classic, timeless piece in the mix. I have hard wood dark stain floors all over my house yet a modern green suede couch in my living room but you will find a traditional upholstered bed frame in my bedroom. In my closet, a mix of modern platform shoes next to classic Mary Jane's. A watch is something that you wear all the time. You need it to be practical yet stylish with pretty much everything that you wear. 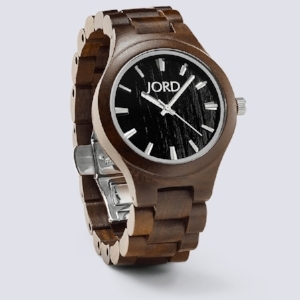 It was honestly very hard to choose my Jord® watch but when I saw The Fieldcrest series Dark Sandalwood It was like seeing my wedding dress for the first time. I knew it was the one! lol! It's gorgeous on their website but let me tell you, in person? even better. This watch is perfect for the season right now but I can see styling it in the Spring or Summer. It's lightweight, very well crafted...A timeless piece....a Classic. I am very pleased with my selection and you will be spotting it a lot throughout the season. Gorgeous!